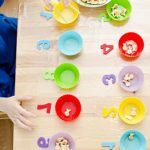 Many parents consider that it’s enough for kids to understand the concepts of «up and down», and that «right-left» is too difficult for toddlers to master. They are not right. Higher mental processes — thinking, writing, reading, and counting — are based on a baby’s spatial representation skills. A toddler’s brain develops very quickly, that’s why parents should introduce new cognitive tasks to encourage this natural process. Therefore, by introducing the concepts of «up — down» and «right — left», you create new zones for further development. Early development will help to obtain knowledge and practical skills in future. The earlier a baby gets acquainted with information, the faster he will learn new concepts. In order to help your toddler learn right and left you need to take into account the peculiarities of his perception and thought. Kids under three understand only what they can see and touch. Their attention is distractible — it randomly shifts from object to object. At this age, a child has no motivation to achieve specific goals. He is much more interested in the process of learning itself, but not in the results. You mustn’t blame the kid if he is not interested in learning right and left. Teach him in an interesting and exciting way — and you will see results soon. Children’s memory is associative. Their ability to recollect something is based on the ability to recognize objects that caused strong emotional reaction. Only after three, a specific memory with the ability to describe events begins to form. Involve your toddler in the learning process, which will be interesting for him. Don’t start the game, which aim is to teach left and right, in an unfamiliar place. This will distract your kid’s attention. During the game try to provoke positive emotions. Immediately stop the game if the toddler gets tired or annoyed. Remind your kid of right and left during daily rituals (washing, eating). At two years old, your toddler begins to master a spoon. This means that it’s time to call the hands «right» and «left». From this moment bodily awareness of left and right begins. Later, the skill to tell the left hand from the right one will boost thinking and logical processes of analysis, synthesis and comparison. It will be easier for your child to learn to tell left from right through games. Tie a red ribbon around the kid’s left wrist and a blue one around his right wrist. Explain to your baby several times which hand is left and which is right. Then play a game of «Show me your hands»: ask the toddler to raise his right hand, and then his left hand. Then you may tie ribbons around your wrists and swap the roles. 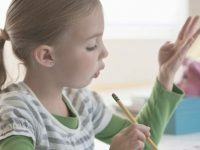 Use drawing exercises: ask your child to draw something with his right hand, and then — the same picture with his left hand. One of the hands will be less obedient. Explain to your child, which hand is obedient. Give your kid a ball and ask him to throw it to you first with his right and then with his left hand. You are to catch the ball with one hand. Specify with which hand you’ve caught the ball and with which hand you are going to throw the ball back to the kid. Pour gouache paint of contrasting colors into two flat plates. Ask your child to dip his hand into the paint and to make first a fingerprint of his left and then of his right hand. Begin to teach to tell the left leg from right later, when the kid can easily tell his right hand from his left, not to confuse the kid. Ask the child to touch his right leg with his right hand and his left leg with his left hand. This will really help! Putting on clothes and shoes is another daily practice, which can help you teach left and right. As soon as the kids starts dressing, tell him, for example: «First put your left arm into the left sleeve and then your right arm into the right sleeve». Kids help lay the table with great pleasure. Don’t miss this opportunity to practice — say that you put a fork, a spoon and a knife to the right or to the left from the plate. Children like to imitate grown-ups. This fact can be your helper in educating your child. Wherever you are together, use this opportunity. Show what you are doing and with which hand. Some more useful activities for teaching a kid left and right. At the age of three you child is ready to play the following right-left games. * Take two chairs. Put three or four subjects on each chair. Ask the child to tell what is on the right chair, and what is on the left one. * Let the kid, standing in the middle of the room with his eyes closed, determine what furniture is on his left and what is on his right. * Ask the child to tell a toy how to get to the kitchen. Let him use ‘turn left’ and ‘turn right’. * Showing your child pictures in books, explain what is to the left and what is to the right. For example: «I can see a bunny under the left bush». * Coloring symmetric images in two different colors can be also useful. Ask the child to color a clown’s clothes or wings of a butterfly.